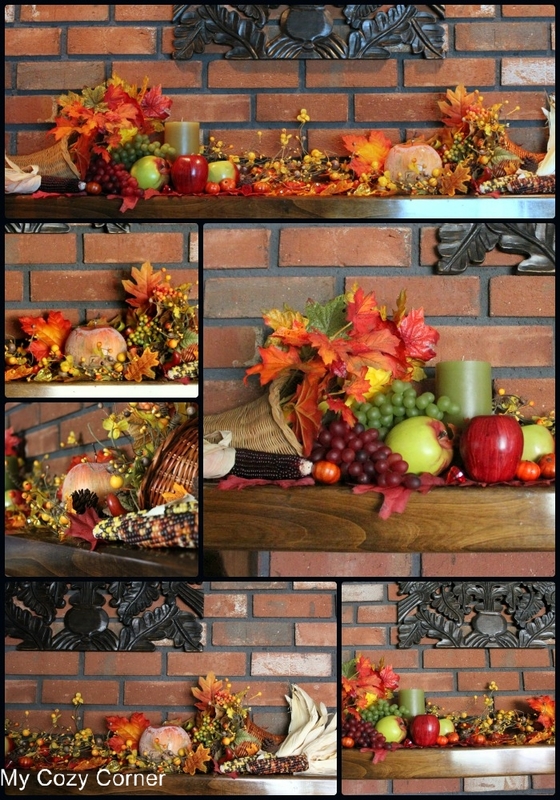 During the month of September I had a bit of Fall on the mantel. Some books, a duck carved by our son, a little pumpkin and a mirror hanging on the fireplace. The mirror is a very important part of this story. I love old books. My father gave me the dictionary in 1960 for Christmas. And the thin red and gray books are collections of poems written by my husband's grandfather. A couple of weeks ago my Sweetheart bought a new 47" wide screen television. We had an old fashioned one for a long time sitting on an entertainment center to the right of the fireplace. Well, the NEW television is mounted on the right side of the fireplace on the brick... The moral of the story is the NEW television was not mounted on the front of the fireplace. Thank the Lord. But, I did lose about 10" of mantel space on the right end. The mirror was out of balance and I had to find something smaller. I found this wooden plaque at TM and I moved my decor on the mantel over 10" on each side toward the center. I like the tight look. Our new television is wonderful for our old eyes. I can see the stats of the baseball game in the corner of the screen now. Without the reflection of the mirror my photographs have a new crispness and bright color. I placed a cornucopia at each end of the mantel and used an abundance of Fall accessories to fill in the center space under the wooden plaque. Candles and Indian corn are so traditionally Fall. I will be adding more Thanksgiving decor next month. Fruit, Bittersweet and Autumn leaves. Betty, your mantle is beautiful! I especially love the way you incorporated your dear books into the display, they look wonderful the way you have mixed them in. Such a pretty mantel. And I'm glad you don't have the television mounted over it. That's a look that often strains the neck. Old books are a great treasure. Love the way you've displayed yours. Hello Betty, thanks for linking to Heart & Home. Your Fall mantle is really lovely! I like the touches of green from the grapes, apple and candle -they compliment the beautiful warm coloured leaves perfectly! I love old books too and having some passed on from parents and grandparents is very special indeed! I love the way you combined everything! What a pretty Fall mantel. Hi Betty....your mantle looks wonderful. I like the autumn colours..
Hey Betty,I'm newest follower visiting your #46 @ A Delightsome Life. Your "falln" is fabulous.Love the cornucopia with natural elements. I have my Daddy's book collection also. Going to put your blog on my sidebar. Very pretty decor! Love the old books and the colors. Glad you are enjoying your new TV! Thanks for sharing, visiting from No Minimalist Here. You fall mantel is so pretty. I love the mix of color, texture, old and new. we have similar mantels and it can be tough to work with such a narrow piece of real estate! Can't wait until after Halloween to redo mine. I love your traditional looking home. I found you on Katherine's Corner. i have been on a houndstooth phase, so I made a houndstooth pumpkin. Your mantel is warm and welcoming! What is it about men and their TV's??? My hubby just came home with a new one too. The screens just keep getting bigger and bigger and that's how hubby likes them. I think I am going to have to add on a home theatre to our house if he gets an even bigger one (which he keeps hinting about). Have a great Sunday. I love your new wooden plaque; your whole mantel looks lovely. It really gives the feel of an abundant fall harvest. It doesn't take any time at all to get spoiled to those big screens with HD TV. We got one two years ago, and the other screens look so tiny now. :) My husband and son mounted ours on the wall above our entertainment center this past spring, so this Christmas I can put my Dickens Village on the entertainment center. Visiting from Seasonal Sunday; have a wonderful week!